Sunday through Tuesday in Chicago will feature two huge conferences. One is the Independent Sector Conference The other is the Social Enterprise Alliance Conference. At the end of the week, on Friday, Nov. 4, is the Tutor/Mentor Leadership and Networking Conference. The schedule for the Independent Sector Conference show many topics related to the challenges and opportunities of philanthropy. Look at the schedule of breakout sessions for the Social Enterprise Alliance Conference. Seems like some of the same themes are being discussed, with different tax structure and strategies for generating revenue being the main difference. If you registered early you could have attended the Independent Sector Conference for only $1,050 (not including hotel and travel). If you register this week the fee is $1,600. The price for the Social Enterprise Summit was a bit lower, but still more than I could afford. If you look at the range of workshops in both events I don't see any that focus on ways to make non-school volunteer-based tutor/mentor programs available in high poverty neighborhoods of big cities like Chicago, or ways to help each program learn from others doing similar work. I don't see anything focused on building the talent in these programs or helping volunteers and young people become leaders. Look at the agenda for the Tutor/Mentor Leadership and Networking Conference, which is being held on Friday, Nov. 4 at the Metcalfe Federal Building in Chicago. We don't have as many workshops, but since you can only go to one in each time frame, what difference does it matter if we have five workshops, or 15 in a time frame? We do focus all of our attention on helping tutor/mentor programs become the best they can be. Thus, I hope some of the people who were able to attend the big conferences at the start of the week will go to the small conference at the end and that the ideas from all three conferences will connect in ways that generate resources, talent and structure that supports the growth of an entire universe of birth-to-work volunteer-based tutor/mentor programs in Chicago and other cities. I'm a big fan of using computers and the internet to work smarter, faster and to expand my network of people and ideas. I feel that if young people learn some of these skills the problems that they face in the future have a better chance of being solved. It's worth reading. What are your thoughts? 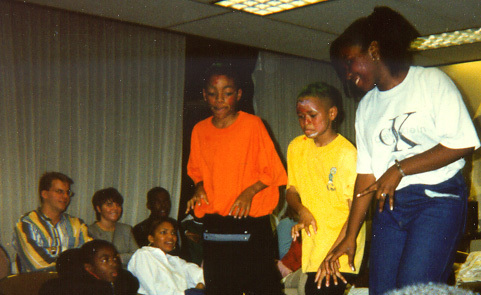 Tramane Montel Ford (in yellow shirt in this photo) got his first taste of acting in 1995 when he became part of the video group at Cabrini Connections. On August 7th he performed his new show, The Tramaine Experience: A One Man Show, and raised money so we can help other kids have similar experiences. 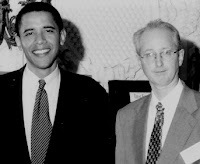 Isaiah Brooms became part of the tutoring/mentoring program in the late 1980s while it was at Montgomery Ward Corporate Headquarters. A couple of year ago he was a Keynote Speaker at the November 2009 Tutor/Mentor Leadership and Networking Conference, where he told how his life has taken a positive direction because of the support he received from his mentor, and the tutoring/programs he was part of. Here's the full transcript of his presentation. Tangela Smith Marlow is another alumni from the Cabrini Connections program. She was the speaker at the June 2010 year end dinner. Tramaine will be one of the speakers during the noon hour next Friday, November 4th as we host the 36th Tutor/Mentor Leadership and Networking Conference since May 1994. If you've hosted this many conferences and led a tutor/mentor program for over 35 years you must have learned a lot. You also must be getting old! Both are true. That's why I'm trying to invite youth who have been part of tutor/mentor programs to come together at these conferences and on our social media pages. I want to pass on what I and others have learned to a new generation of leaders who know from their own experiences how important a tutor/mentor program can be in their lives. If you know of someone who has been mentored, or who has been a volunteer, ask them what they are doing now to make sure this experience is available to others. Encourage them to visit the conference web site and the Tutor/Mentor Institute, LLC web site and begin to learn ways they can pick up this baton of leadership and carry it for a few more laps. I created this graphic over the weekend as another attempt to communicate visually what I have been trying to do for the past 18 years, in fact all the way back to 1975 when I first started leading a volunteer-based tutor/mentor program. I firmly believe that connecting a youth with a non-family adult in a structured, on-going tutor/mentor program is a good thing. It has an influence on both the youth and the adult but in so many different ways that it is difficult to quantify. I'm not trying to recruit those who don't believe. 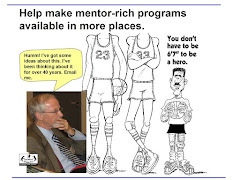 I'm trying to connect with the thousands of people who have already been part of tutor/mentor programs at some point in their lives and already know how they have been enriched in big or small ways as a result. 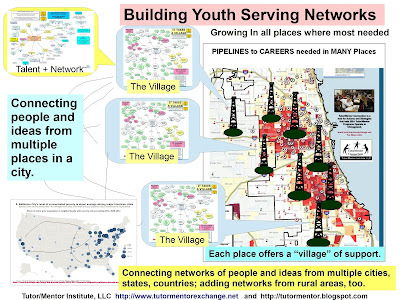 In order for these programs to reach youth in high poverty areas of big cities like Chicago and to involve volunteers who work full-time jobs in many different industries the programs need to operate in non-school hours and in places where youth and volunteers feel safe participating. In such places the program/organization itself becomes part of the mentoring process. It sets a tradition that connects past, current and future participants of that program. In a city like Chicago with close to 200,000 youth living in high poverty neighborhoods there needs to be hundreds of small tutor/mentor programs serving k-12 youth. For such programs to grow in more places teams of leaders need to step forward who act as a 'virtual corporate office'. They do things that people in the corporate offices at WalMart, Sears, McDonalds and other big companies do everyday to support multiple stores in many locations. If we know who the existing programs are then we can lower their costs of operating and we can enhance the quality of their work if we can influence the flow of operating dollars directly to each program and if we can influence the flow of manpower and talent to each program. If programs have access to capital for innovation and if they have talented people learning ways to get better by learning from what other programs are already doing, then we can also enhance the quality of every program by collecting and sharing ideas that can be used by any program at any time. Every big city in the world has areas with high poverty where the gaps between rich and poor are growing wider every year. That means there could be teams and leaders in every city trying to collect information about existing organizations and trying to influence the flow of dollars, talent and ideas to all of the programs in their cities. I have hosted a Tutor/Mentor Leadership and Networking Conference every six months since 1994 to help stimulate the sharing of ideas among leaders of programs and to build greater visibility for tutoring/mentoring that would drive more donors and volunteers to each of the programs in the city. The next conference is Friday, November 4 and because of my own lack of dollars and the few leaders in Chicago who embrace this strategy, I'm still trying to build attendance for next week's event. The map below shows the goals of the conference. If you can't join me in Chicago why not join me in this forum? 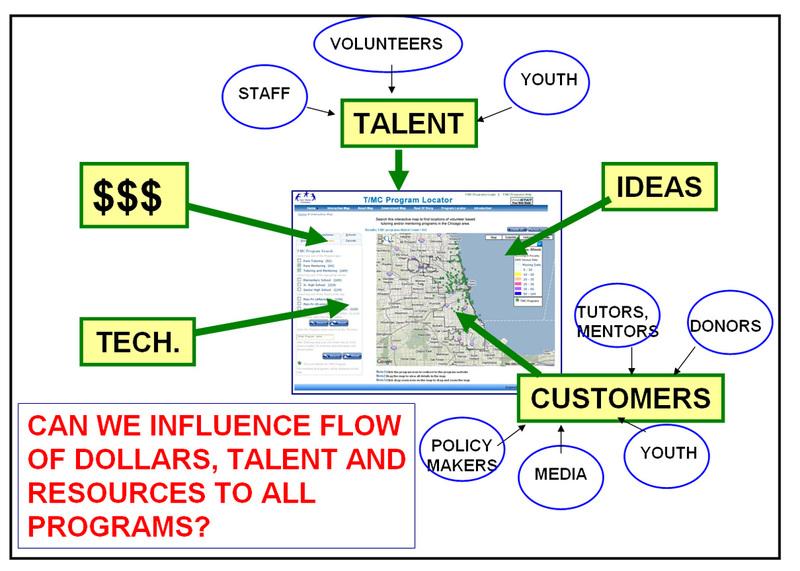 If you are someone who already believes in this logic and sees that you could take a role in influencing the flow of resources to tutor/mentor programs in Chicago or your own community, let's find a way to connect. This PDF report titled "Building critical social infrastructure: The business case for expanding support for school based mentoring in Australia" is focused on school-based mentoring in Australia yet could be used by any city in the US to build support for school-based and non-school mentoring strategies. The National Youth Mentoring Benchmarks, starting on page 30 of the report, can be used by any mentoring organization as standards of excellence to shoot for. During the Nov. 4 Tutor/Mentor Leadership and Networking Conference in Chicago, Dr. Clara Carter, former Director of Training for the Maryland Mentoring Partnership, will host a workshop focusing on "The Elements of Effective Practice" shared by MENTOR, the National Mentoring Partnership. If you're building or trying to sustain a mentoring strategy you are encouraged to attend the conference and this workshop. 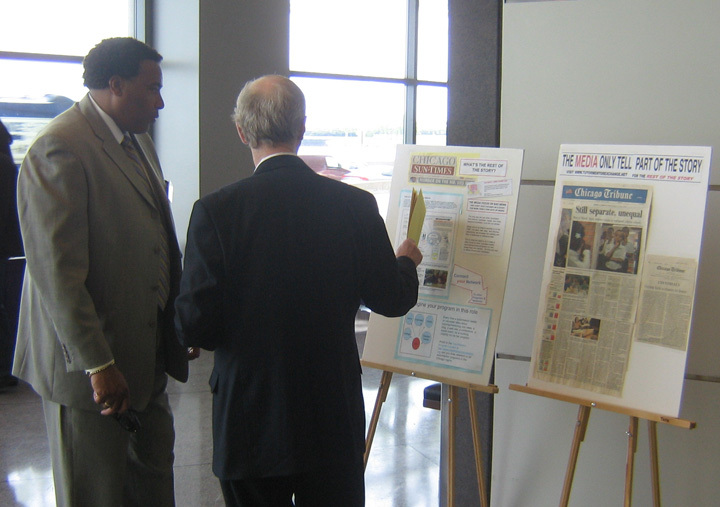 On Wednesday I posted my first summary of the National Dropout Prevention Conference in this article. Here are some quotes from people I heard. "African American children comprise 17% of the youth population, but 34% of all school based suspensions and 45% of all juvenile arrests." You can find more statistics like this on many different web sites. 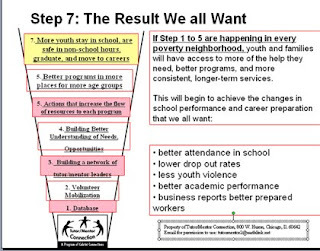 However, where can you find maps and marketing strategies intended to increase the number of people looking at this information and increase the distribution of operating dollars to schools and non-school mentoring and learning centers in all of the high dropout school areas? I've been inviting people in Chicago to look at this information and connect via the May and November Tutor/Mentor Leadership and Networking Conference for over 15 years. I've attended events hosted by others and encouraged them to connect their conferences and forums with me and each other via the Internet. For the most part this has been like spreading seed on rocks and deserts. Yet, after just meeting for a brief while on Skype, David Prince helped me set up this "mentoring kids to careers" discussion on the Debategraph portal that he hosts in the UK. David posted this introduction to the Tutor/Mentor Institute blog article earlier this week. Anyone in the world, or in Chicago, can use this forum to innovate ways to increase the number of people and donors who support dropout area schools and non-school learning centers. Anyone can log in and add new information to this map, or create their own set of maps showing their own ideas of how to end the dropout crisis. When I say "anyone" I mean that billionaires, sports stars, rock musicians, high school clubs, politicians, etc. can use this. If some do, perhaps they will begin to apply the ideas using their own time and talent to help more kids to careers. Interested? Come to the November 4 Tutor/Mentor Leadership Conference in Chicago. Join us on-line in the Debategraph forum, or in the Tutor/Mentor Connection forum. I attended the National Dropout Prevention Conference this week along with about 700 other people from around the country. I was a workshop presenter at 8am Monday morning and spent the rest of the time networking with a wide range of people. I want to thank Ed Bates of the Lake County Regional Office of Education for encouraging me to participate. Ed was a co-chair of the conference organizing committee. I created this concept map to introduce you to the people and organizations I met through workshops, sitting at lunch together and attending a dinner event on Monday. Over the next couple of weeks I'll post some quotes from some of the presentations and I'll reach out to the people I met and invite them to share their workshop presentations so you can learn more about what they talked about. In this map I also pointed to other information I'd already aggregated about the Drop-out Crisis which is posted in the Tutor/Mentor Library. The real challenge is not finding more ideas, but finding ways to draw more people together to understand and apply these ideas in more places. A couple of weeks ago I was part of an "Improving the Education System" panel hosted by Becoming We the People and held at The First Unitarian Church in Hyde Park. While the attendance was around a dozen people this was recorded and posted on YouTube so it is available to many more people than the number at this week's conference. In three week's (Friday, November 4) I'll host the next Tutor/Mentor Leadership and Networking Conference and the goal will be the same as these other events. We need to find ways to surround youth in poverty areas where the dropout rate is the highest with mentors, tutors and extra learning and enrichment opportunities so we help build aspirations and prepare more youth to come to school every day better prepared to learn. If you're concerned with the dropout crisis and see mentoring as part of the solution I encourage you to help me build attendance for the Nov. 4 conference. One of the panel discussions will be recorded by Becoming We the People and available on YouTube in the weeks following the conference. The Web is full of tributes to Steve Jobs, who died this week. I've used Apple computers since the early 1980s so everything I do and write about has been influenced in some way by his work. In today's paper I read one quote saying "Don't let the noise of others' opinions drown out your own inner voice." This is very similar to a quote from Merri Dee of WGN TV that I've borrowed and used for over 18 years. "If it is to be, it is up to me." In another article I read about "Apple U.: A degree in Jobs". In this article the writer talks about how Jobs created a training program within Apple to teach new leaders to think and act like he did. Wow. Last January I wrote an article titled The Problem is not Schools, It's Poverty. I wrote a similar article earlier this week. In the January article I pointed to the Broad Foundation who has set up The Broad Center to educate principles, superintendents and others and place them in school districts all over the country. 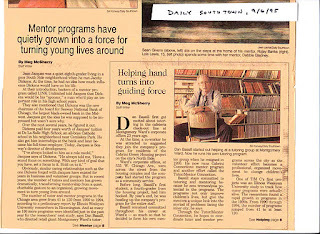 If you've read many of my articles you can see how I'm looking for a benefactor who would combine the thinking of Apple U with that of the Broad Foundation and create a Tutor/Mentor Institute that would educate leaders from all sectors to use the ideas available via the Internet to design and implement long-term strategies that help kids in poor neighborhoods get the extra supports needed to move through school and into 21st century careers. In this Tipping Points essay which I wrote more than five years ago I point out the need for new strategies to provide leadership for the thousands of non-school organizations that need to be available in cities across the world. The only way to make this happen is to find visionary leaders with single-minded determination and unlimited energy who say "We'll Build It. They Will Come." Today in the Chicago Tribune is a commentary titled: Economic inequality: The real cause of the urban school problem This was written by economists from Harvard and the University of California at Berkley. The authors write, "Our findings show that the root of the problems facing urban schools can be found in gradual but extremely powerful changes in the nation's economy — not the least of which is the increasingly unequal distribution of family incomes." I've been using maps since 1993 to try to show this income inequality and the connection between high poverty concentrations and poorly performing schools. We include maps in many of the articles we've written on this blog and in the MappingforJustice blog. Our interactive Program Locator can be used to create your own map story for your own communications. Every time I've hosted a leadership conference in Chicago (the next is November 4) I've put maps on easels to help others see the power of these as a tool to focus attention and resources to volunteer-based tutor/mentor programs in all high poverty neighborhoods. I've tried to get attention of leaders who've attended the conferences so they would incorporate maps and our strategy of volunteer-based tutor/mentor program growth into their own leadership. Today there was another editorial in the Tribune, challenging the way TIFF money seemed to go to charities favored by the Mayor and his wife. 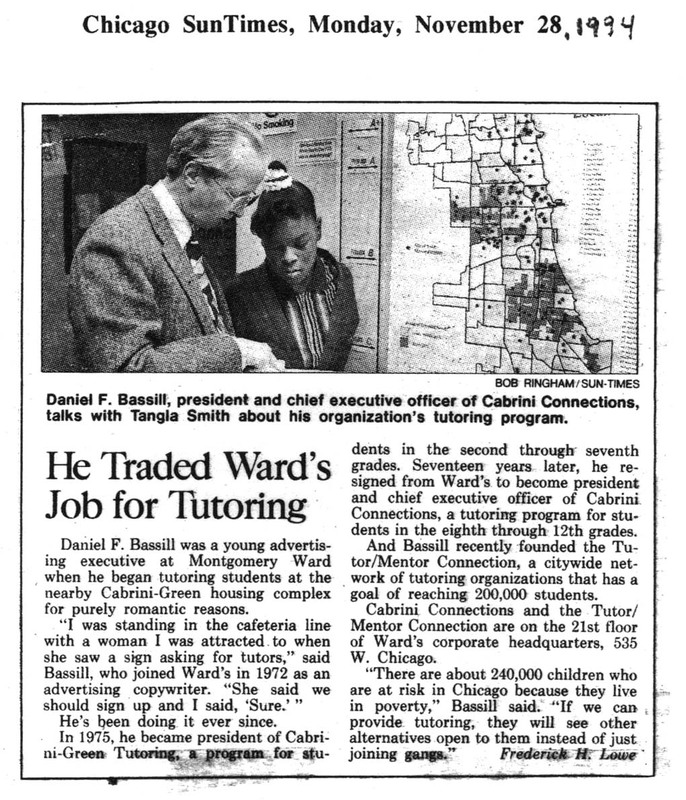 If the Mayor had incorporated T/MC maps into his efforts to help kids in poverty perhaps the aldermen, state legislators and others would do the same. 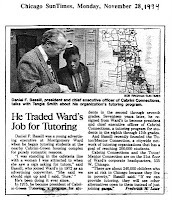 Were that happening there would now be a much stronger distribution of high-quality tutor/mentor programs in all of the poverty areas of the city and suburbs and perhaps there would be a different future for some of the youth who have grown up in neighborhoods of high poverty and under-performing schools. That's the past. We have a new Mayor and we have another presidential election. We have new research. Now can we interest some of the leaders and people who are concerned with poverty and its impact on the economy and quality of life for all of the people in the region to participate in the next Tutor/Mentor Leadership and Networking Conference on Friday, Nov. 4 at the Metcalfe Federal Building? 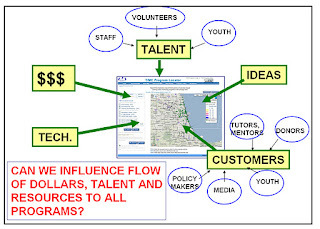 Can someone step forward to become the Steve Jobs who bring vision and financing to the Tutor/Mentor Institute, LLC to help build tutor/mentor program support infrastructure in Chicago and other cities? 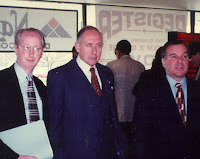 I've been building a Directory of Chicago area tutor/mentor programs since 1993 and have hosted a networking conference every six months since May 1994. The article below is one of many that have been written as a result of this strategy. This one was from the Daily Southtown. 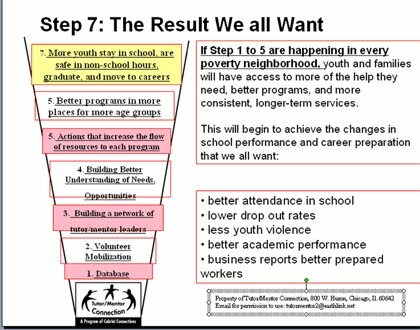 It includes a message (see pdf) that I've been delivering consistently for 18 years of mobilizing resources to support high quality tutor/mentor programs in all poverty neighborhoods of Chicago, not just one or two high quality programs in a few places. In 1995 I was optimistic that I could find enough philanthropic investment to build and sustain the Tutor/Mentor Connection. Due to economic factors, the 9/11 tragedy, wars on terrorism, etc. we've not been able to raise consistent funding for operations and innovation. This past summer I had to create the Tutor/Mentor Institute, LLC as a new strategy to find the revenue, partners and investment to do what I've not been able to do as well as needs be for the past 18 years. Yet, we're still here. If you search for "tutor mentor" on Google or Bing our web sites come up on the first page and are a resource to people all over the world. The Nov. 4 conference has a great agenda. If we can attract 75-100 paying participants (we keep fees low, give group rates and offer scholarships at $20....and all speakers attend at no cost), we can cover our expenses and provide some money to support the data collection, web sites and other costs of hosting the Tutor/Mentor Connection. Yet we won't thrive until we find an investor willing to put his/her name on the conference, or the mapping site, or the Tutor/Mentor Institute itself. That would take a multi-year commitment of several million dollars. Yet it would do more to help inner city kids to careers than much of the billions that have spent so far over the past 20 years.